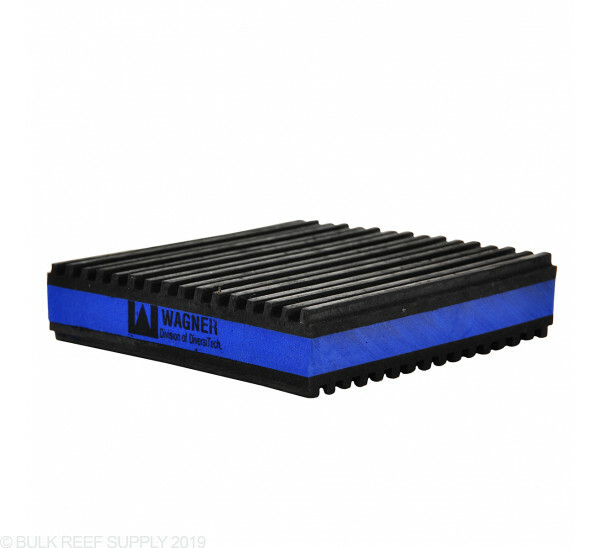 These sound dampening pads work best with heavy external pumps where there is significant vibration being transferred from the pump to the surface the pump is mounted too. Made from foam pads with a ribbed rubber lining. Dimensions: 3.75" x 3.75" x 1"
I had these in my tank for a bit, took them out for a while and went to go put them back in... I was washing them of and all of a sudden what looks like blank ink is leaking out of the black sides of the pads. I WOULD NOT PUT THIS IN YOUR TANK. I thought it would stop after washing it for a bit, but the black stuff just keeps coming out. looks like a ink pad soaked in ink leaking. It worked great but hate that it floats so easily. Once under the pump worked like a charm. This is a solid product, very well constructed. Do yourself a favor and check the reviews, youll see that there is a lot of measurement talk. Please take measurements of your pump base and compare with the pads, I needed 2. Does an efficient job of damping sound. My only complaint is that it's much too small. Wish the pad was a little larger my pump doesn't quite sit on the pad to good but still does what it is intended to do. This is a amazing pad and works perfectly. I gave one less star because the larger sizes found hear http://www.diversitech.com/Product-Sub-Category?id=a04C000000JpCrgIAF would be very useful. It made quite the difference. I bought 2 for two different PanWorld pumps. One was going to be used as my return. But, one simply is not enough... The whole square needs to be at least a good 1"-2" larger to fully support the pumps foot; it's just too small. I oped for a few mouse pads. Nothing fancy but it did help to muffle the sound of the return bump against the glass of the sump tank. I have a PanWorld 250PS monster. I purchased 6 sound dampening pads and they reduce a lot of the noise and energy. However they don't stop most of the strong vibrations from the motor, which eventually hit my floor so i can feel the pump. Granted most pumps don't put out as strong of vibrations. The pad its is very stiff and rubber-like. Its VERY small, buy two for any decent sized pump, I had to reorder some. The picture is deceiving. Overall a good product that does the job. Is this safe to go inside my sump ? If not....what is? These are intended for external use only. For in sump use your best bet would be a silicone pad. The pump is not intended to be submersed though I have heard stories of people putting them in zip lock baggies, plastic wrap, etc, we haven't ever tested that ourselves. Is this safe to use under water? am planning on using it under my submerged return pump and I read somewhere that its not safe if fully submerged. It is meant for external use. We haven't ever tested it submerged before and it would be hard to say what is in the glues, etc, though I have heard of people sealing them up inside of other things and using them underwater.